AIIMS MBBS Entrance 2015 Online Application, Apply Now for AIIMS MBBS Entrance Exam Online Application 2015. Applications are invited for AIIMS MBBS Entrance Exam 2015 Registration in the prescribed form through online mode only for the Entrance Examination for admission to the MBBS Course of AIIMS, New Delhi and six other AIIMS (Patna, Bhopal, Jodhpur, Bhubaneshwar, Rishikesh and Raipur). 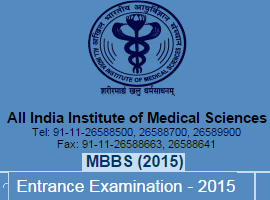 AIIMS MBBS Entrance 2015 Date & Examination Centres: Monday, 1st June 2015 at various centres all over the country. The Entrance Examination will be conducted only in Online Mode [Computer Based Test (CBT) ] in two shifts (9:00 AM to 12:30 PM and 3:00 PM to 6:30 PM). Online Registration for applications: Opens on Tuesday, the 17th March, 2015 and closes on Friday, the 10th April, 2015 at 5:00 PM (1700 Hrs) Important: Candidates are advised to visit the website www.aiimsexams.org regularly for the Prospectus, detailed instructions and online Registration and any subsequent Addendum/ corrigendum/Information etc. will be uploaded only on the website. How does one apply for the AIIMS MBBS Entrance Exam 2015 ? The Application can only be made Online. Printed Application Forms are not available. You must have a valid email ID and a mobile number. Visit AIIMS website www.aiimsexams.org. Select your Course in Registration/Login Section. Click on Proceed on New Registration Section. Click on Prospectus, Read Instructions of the Prospectus and guidelines. Register yourself by filling the requisite information Carefully, While filling the email ID & Password ensure that the correct email ID is registered. After filling up all required information click on Save & Proceed, the entered information will appear on the screen, check thoroughly that all correct information is filled. In case, any change, use the Edit option, otherwise use Save & Proceed. The Registration No. allotted will appear on Screen, Note the Registration Number for future reference. For Re-login on your Registration Form Click APPLICANT LOGIN, enter your Registration. Number and Password (all registered during filling up Registration form). In case, the Registration Number is not traceable, please note the same from INBOX of your E-mail ID. In My Page all the navigation button & Step are available. Reopen your Registration form, fill up the required information, Colour Signals (Green & Red) will appear on the above portion of Screen about procedure completed or to be completed. For making payment through Computer Generated Challan in any Branch of SBI, Print, the Copy of Challan, the data will be upgraded after 48 hours in the SBI Branch, Therefore, you are advised to visit the concerned branch of SBI after of 48 hours of Registration of your application. Please retain the challan copy of candidate after making payment to the branch of SBI. For making payment through Credit/Debit Card, follow the instruction given in the Prospectus. The online Registration Form takes minimum 24 Hrs – 72 Hrs to upgrade the final status after completing all steps of Registration Form. After showing all steps “DONE” the candidates must take print out of Registration Slip for future reference.